Images and optional accessories are shown here for example only and may not accurately represent the actual tractor model and/or available cab accessories. Cab photo displayed above may include optional accessories which are available at extra cost. Cab designs are subject to change without notice. Yukon Cabs are bolt together cabs with redesigned styling, borrowing from our Dakota cab, but with the economics of our traditional standard cab. Included are features such as a styled ABS roof, LH soft door, powered front wiper on a safety glass windshield, and rear safety glass panel. This cab will fit bare tractors or tractors equipped with a KL120 Loader. This cab will fit tractors equipped with either the fixed ROPS or the folding ROPS. Cab is not ROPS certified, but fits over the existing, un-modified factory ROPS. 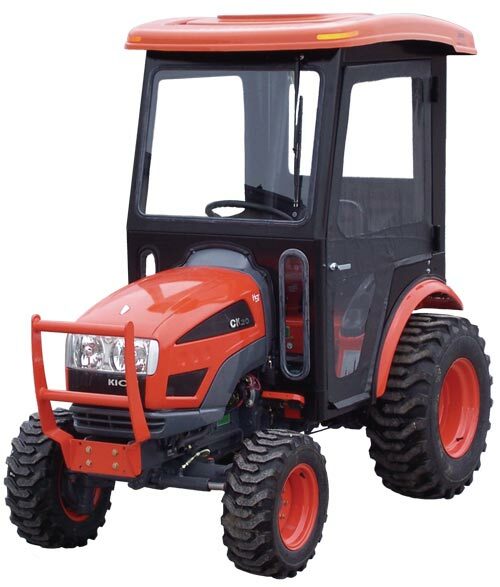 This cab will NOT fit newer style tractors equipped with the adjustable suspension seat. Refer to Sims P/N KIOTCK20, and select the optional base cab P/N E25102S. For the Hard Door Option, refer to Sims Part Number KIOTCK20 and select P/N 1001-1885S. Optional Features: Prices shown are the discounted prices when purchasing them with an enclosure.